My daughter loves the flashcards and plays with them pretty much every single day. Right now, she arranges them so that they are in order. She has a poster up in her room that came with the Zaky Arabic Alphabet DVD so she can check her work as she arranges them. After she arranges them, she traces each letter with her finger. She hasn’t yet started to write the Arabic letters on her own, but she traces them on the flashcard, so it’s good practice for her. We can also work on the sounds of each letter, using the flash cards by choosing letters at random. As she gets older, we can form simple words using the cards. 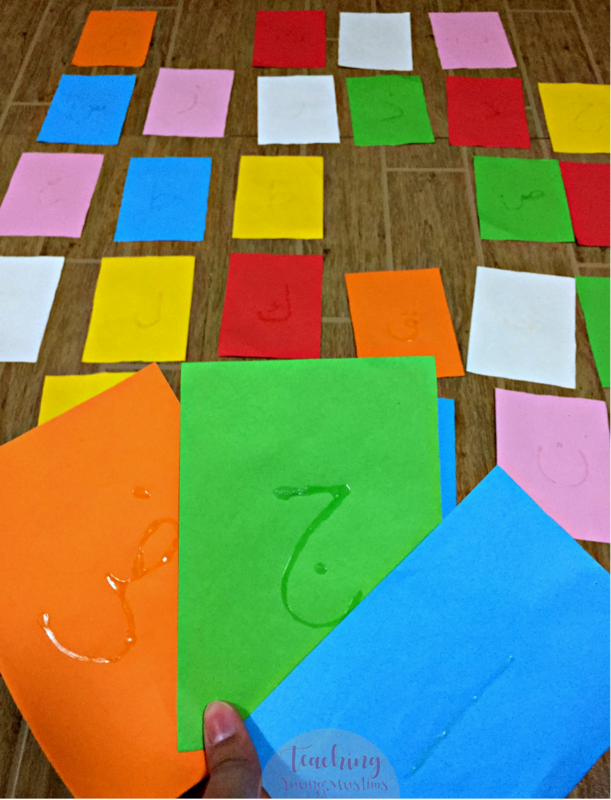 Have you made alphabet flashcards? What have used to make them? Let me know in the comments section below! I’m thinking of adding a set of Urdu alphabet flashcards, for an easy comparison of the alphabets of the two languages. I think my daughter would find that fascinating!